Confirmation from the BC Government in March 2010 regarding the new master planned entertainment complex by BC Place Stadium resulted in mixed opinions by local residents. 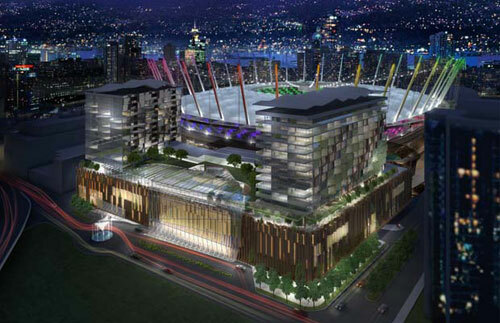 The proposed BC Place Entertainment Complex would include a new casino and two hotels beside the BC Place Stadium site. The 110,000 square foot twenty four hour casino and two international hotels by BC Place would also bring in five new restaurants and plenty of new construction and professional jobs for the downtown Vancouver real estate development. The BC Place Casino and Hotel project would cost roughly $450M and take over 2 years to build out. Attached to BC Place Stadium, the downtown Vancouver entertainment complex would include the Las Vegas based casino operator Paragon Development Ltd in the largest master planned entertainment style project that the province has ever seen. PavCo is the Crown corporation that operates BC Place Stadium and Pargon Development operates Edgewater Casino at the Plaza of Nations. The BC Government announced that this BC Place Casino and Hotel project will increase direct and indirect jobs by 8400 during the course of the development phase and contribute extensively to the new rectractable roof for BC Place Stadium. This east Downtown Vancouver district needs this development to revitalize the community, said the government officials. The 70 year lease by Paragon for the Casino land in addition to the $6million annual lease, will be used to pay part of the $450M rectractable roof project. In addition to the two internationally recognized hotels, there will be a twenty five thousand square foot rooftop that will link the two BC Place hotels and provide a swimming pool, rooftop deck, meeting space and entertainment destination with increased nightlife venues for the downtown Vancouver real estate district. From chef signature restaurants to new age organic homegrown boutiques, the five new restaurants on site will also add to the community amenities for local residents. With the BC Place retractable roof project set to start this year and be completed by 2011, the BC Place Casino and Hotel real estate development project is expected to begin in early 2011 and completed by mid 2013 (for a two year construction timeline). The proposed downtown Vancouver BC Place Casino and Hotel project is now a go. The skyline will change forever starting May 3rd, 2010 and the deflation of the BC Place Stadium dome will be replaced with a retractable roof. After 27 years, the dome will burst and the new state of the art roof system will be installed at a cost of $458 million. Part of the expense will be covered by the newly announced Vancouver BC Place Casino and Hotel project that was proposed a while back, but now seems to be a go. The last event to take place at BC Place will be the Vancouver International Auto Show on April 4th and will re-open in the summer of 2011 once the BC Place retractable roof has been successfully installed. Part of this master planned downtown Vancouver real estate development project will be paid with a six million dollar annual lease from the Las Vegas based Paragon Gaming Company which inked a 70 year contract for the parking lot just west of BC Place Stadium in downtown Vancouver to build the largest casino project and hotel complex in all of British Columbia. In addition, PavCo has a forty year, taxpayer funded loan that is supposed to be defrayed by lease revenue, advertising and events. The new BC Place Casino and Hotel Project will feature the rectractable roof installation, big Paragon Gaming Casino and 2 hotels. The BC Place roof renovation costs increased from $365M in Jan 2009 all the way to $563M in Oct 2009. After the BC Government announcement of the BC Place Casino and Hotel project, local residents voiced their concern over traffic and noise with the addition of the casino and the two hotels close to residential areas. The 680,000 square foot BC Place entertainment complex will create jobs and bring up to one hundred and thirty million dollars per year to the area. Many residents believe that there are more pressing concerns over this ever growing downtown Vancouver community around BC Place and GM Place including grocery stores, a hospital, schools, park area and supermarkets. As soon as the proposed downtown Vancouver BC Place Entertainment Complex was confirmed by the government, local officials also agreed that the original plans for the ‘black box’ Las Vegas Paragon Gaming Company Casino would have to go. 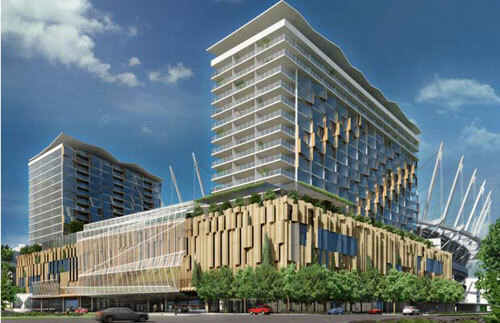 The design of the architecture and exterior façade just didn’t fit the downtown Vancouver False Creek area, and therefore, the renderings were quickly dismissed. As part of the plan, the downtown Vancouver BC Place Entertainment Complex is a joint effort between the BC Government backed and operated PavCo Development team and Paragon Gaming Company, an operator of world class casino resorts. As part of the leasing deal and the go ahead for the BC Place Casino, part of the revenue generated will go towards the refurbishment of BC Place Stadium’s rectractable roof project set to begin soon. The Casino and Hotel project at the downtown Vancouver BC Place Entertainment Complex is set to break grown early 2011 with a two year construction period. This is a very quick process, as the the proposals usually take at least one year (sometimes two) for a development company like Paragon Gaming Company to go from the formal application stage (which PavCo and Paragon haven’t even started for the BC Place Entertainment Complex in Downtown Vancouver real estate district), and then through a series of public hearings and rezoning applications. Some of the most interesting plans in the proposal is that Paragon Gaming Company is asking for three times the space of their existing Edgewater Casino in Plaza of Nations, and this massive downtown Vancouver BC Place Entertainment Complex will not only cover a new casino, but also two highly rated internationally branded hotels and five new restaurants. With a great site overlooking False Creek and across the water, Millennium Water, the former 2010 Athlete’s Village, the project site requires a spectacular façade and modern architecture according to city officials. Both PavCo and Paragon Gaming Company are currently working together in order to achieve that goal. It is likely that Paragon will move Edgewater Casino over to the new downtown Vancouver BC Place Casino once complete, although the license for Edgewater Casino expires in mid 2013, possibly before the new downtown Vancouver BC Place Entertainment Complex is completed.